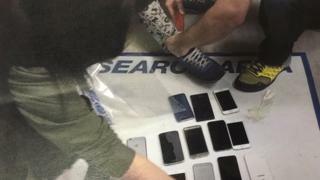 A man was found with 38 mobile phones stuffed down his trouser legs at a Libertines concert, police say. West Midlands Police said the man was spotted at the Barclaycard Arena in Birmingham on Wednesday evening with his trouser legs taped at the bottom. He and another man, who also had his trouser legs taped have been arrested on suspicion of theft. Police said there had been reports concert-goers were targeted at the band's performances in Manchester too. Anyone who thinks they may have had their phone taken on Wednesday should contact police. The band performed in Manchester on 23 January.